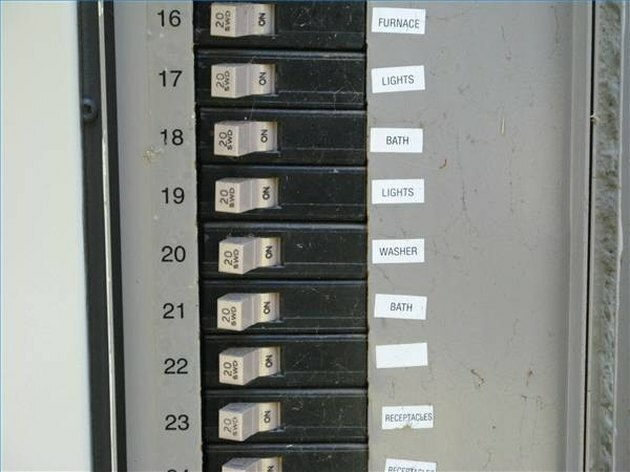 Changing a fuse box to a circuit breaker is a challenging task for the average do-it-yourself person. The reason is that the wiring has to be worked hot. In other words, there is no way to shut off the electricity coming into the fuse box unless you ask the utility company to pull the meter. It is important that you understand electricity and are comfortable in working with it. It might be wise to ask a licensed electrician to work with you. Remove all of the fuses from the fuse box. This cuts off the electricity that feeds the circuits in the house. Disconnect all circuit wires in the fuse box. There should be two hot wires and one neutral wire running into the fuse box from the meter. These will be the larger wires with the neutral wire being either white or bare copper. Disconnect the neutral wire first and if it has a covering, wrap electrical tape around the bare portion of the wire. Make three wraps around the wire leaving enough tape on the end to keep someone from touching bare wire. Disconnect one of the hot wires being very careful not to touch bare wire or any metal. Use a screwdriver and pliers with insulated handles. Immediately tape the end of the wire after it is disconnected. Disconnect the second hot wire and tape the end. 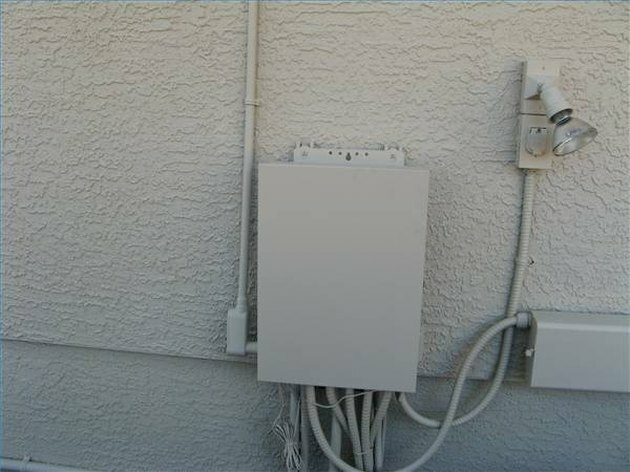 If the fuse box is mounted outside of the house, there should be some sort of ground wire in the box that runs to a rod driven into the ground. Disconnect this wire. Remove all cable clamps and conduit connections from the fuse box. Detach the fuse box from the wall and carefully pull out the wires. 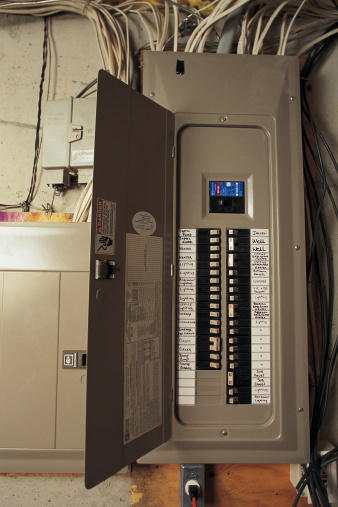 Remove the inside cover from the breaker box and determine where wire entries need to be made. Punch out the appropriate knock-outs. Be very careful not to remove knock-outs where holes are not needed. Mount the breaker box securely onto the wall. Thread the disconnected wires into the box and reattach all cable clamps and conduit connections. Somewhere in the breaker box, there will be one or two neutral/grounding bus bars with a row of connections. Loosen the screw on one of the connectors, slide the ground wire into it and tighten the screw. In the top of the breaker box, there will be two large connectors. Carefully take the tape off one of the black wires and connect it to one of the connectors. Repeat this process with the other black wire and the other large connector. Connect the neutral wire to one of the neutral/ground bus bar connectors. Connect all of the white wires from the house circuits to the neutral/ground bus bar. Connect each black wire to a separate breaker and snap the breaker into one of the hot bus bars. . Turn on all of the breakers one by one. If a breaker snaps off, there is a bare wire touching metal or another bare wire. It is also possible that a connection is not made correctly. Retrace your installation steps and see if you can find the problem. If you are unsuccessful, you will need to call an electrician. Robert Fears has written agriculture, wildlife and industrial pest control articles since 1974. His articles appear in "The Cattleman", "Gulf Coast Cattleman", "Beef Producer" and "TRACKS" magazines. Fears holds a Master of Science in range ecology from Utah State University and is a member of the San Gabriel Writers' League.